I believe I’ve found the best and safest bedside handgun solution for my home. I’ll tell you why I no longer keep my gun in a drawer or holster. What home protection means to me while I sleep and what I sleep with at night. I’m a big believer in home defence. Over the years I have progressed from a baseball bat to a shotgun to a handgun. I’ve also always had a dog and signs and a security alarm. 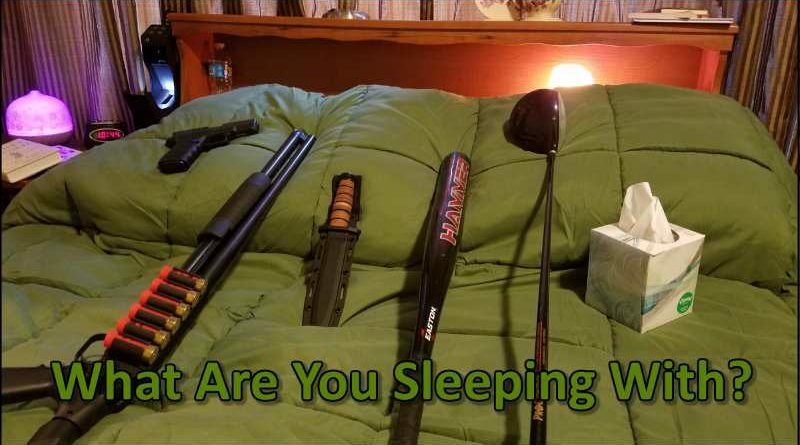 For this article, I think today I’ll stick with what I’m using right now and concentrate on what and how I store my bedside handgun at night. For the moment, my bedside handgun and everyday carry is a Glock 19. I like Glocks but that really is just my personal preference and I’m not interested in convincing anyone to change gun brands. I recommend you stick to what makes the most sense for you, what you’re comfortable and proficient with, as long as it is reliable. First, I need to stress that “how” we keep guns in our home, or anywhere else, is a responsibility that should not be taken lightly. We never want our firearms or weapons to fall into the wrong hands, especially a child. I’m not going to lecture on here, but I feel I have to stress gun safety anytime I’m talking guns. A little background and what changed for me. For several years (more like 7 years) we’ve hand grandchildren living with us. Before that, we had our own children home. I’ve always been a gun owner so gun safes and in-home open carry was generally my solution. The safest place for my gun while at home, in my opinion, is on my side. Other guns in the home stay locked in a gun safe. At night, and what I want to talk about, is what has recently changed for me. My bedside handgun. All of my children and grandchildren have left the home. Yay! Now it’s just my wife and I, along with our dog Sadie. The first thing I did once everyone was gone was to change the locks and walk around naked. Okay, that’s not entirely true, but I did change the garage access code. LOL, I also attached a cheap Blackhawk holster to my bed’s box spring. At night, I holstered my pistol (loaded and chambered as always) at my bedside in that open holster. Once awake and dressed in the morning, I strapped that same gun into my concealed carry holster. Last week I was in the shower getting ready for my day. Without notice, my youngest daughter needed to drop our seven-year-old grandson off at our home for a few hours. My wife let them in while I was still showering. Once out of the shower, I could hear my wife and grandson talking in our bedroom, which is next to the master bath. Instantly I freaked. I had a loaded and chambered Glock (no safety button or lever on Glocks) just feet away from a very hyper child. Obviously, I took action in two ways. I asked them to leave the bedroom and removed the gun. Tragedy avoided. Later, I researched bedside gun safes. Fingerprint or combination lock for my bedside gun safe? My first thought was to find a fingerprint (biometric) lock for my bedside safe since every second may count if I need my gun for home protection. Then I researched it. It doesn’t look like the technology is quite there yet, based on the reviews, for reliable biometric fingerprint scanner and activation safes. On gun safes that offered either fingerprint or combination locks, most of the lower reviews were for the fingerprint versions. Nope, I have to go with a combination lock, for the time being. I wanted a bedside safe that I could easily train myself to open in the dark and without much thought. My main gun safe has a standard digital keypad but isn’t as “time critical” since that one is used to safely store and protect guns that I’m not using for home protection. I decided on a simple quick access combination lock rather than a standard keypad or roller lock. 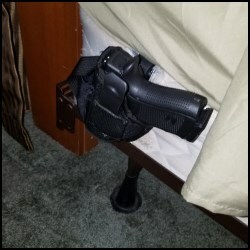 Even though I keep the bedside safe open while I sleep (yes I do), I want to be able to get the gun in-hand as fast as possible when it is locked up. I’m using the GunVault SV500 SpeedVault for my bedside handgun safe. 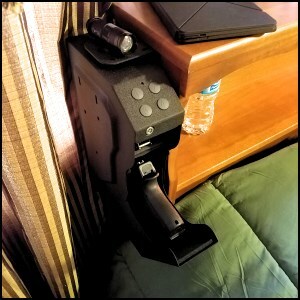 After my research, I purchased a “GunVault SV500 SpeedVault Handgun Safe ” through Amazon and had it attached to my bed headboard two days later. I love Prime! While I’m happy so far, I’ve only had this thing a few days so I am not ready to give this product an endorsement or review yet. I like to fully test and use a product over time before I recommend it. I will try to remember to come back in a few months and leave a better opinion. How I’m using the GunVault SV500 SpeedVault. I’m left-handed and sleep on the left side of the bed so I obviously attached the gun safe to the left side of my bed. I wanted to mount the gun vault a little lower than it is right now but my mattress is slightly wider than my headboard and I didn’t want it to stop the safe from opening. Now I’m glad I went a little higher (about head level when laying down) because it is easier to notice if it is open or closed. I love the fast access of the SV500 SpeedVault . I can get in there in under a second. Admittedly, that is while I’m wide awake and no one is in the process of kicking my door in. On that note, as I mentioned above, I actually keep the safe drawer open at night while we sleep. I’m forming a habit of closing it as soon as I wake up – before I jump in the shower. 😉 But if I need my handgun from a dead sleep – it’s right there waiting without buttons or combinations. GunVault’s SV500 SpeedVault does have an interior light that comes on as soon as the drawer drops open but it only stays on for a couple of seconds. That’s perfect for me so it is not killing the 9-volt battery while it stays open all night. I also disabled the audible “beeps” the combination keys make by default when pressed. The GunVault SV500 has a convenient “mute” button for just that. Overall, I’m happy with my new home protection/bedside handgun safe solution. I feel like it’s much safer for an unexpected but friendly visit yet offers the same level of home protection and quick access that my open holster did. What are you using for home protection? Do you have a bedside handgun? Guns of any kind? Let’s talk about it. Comment below.